For Robin Ball, the co-owner of Sharp Shooting Indoor Range & Gun Shop in Spokane, Washington, National Suicide Prevention Awareness Month provides a reminder of the importance of responsible firearms ownership and storage. Robin was a firearms novice when she began her career as a range owner and retailer, and it quickly became clear that helping to prevent suicide by firearm in her community was an important part of her business. Two-thirds of firearms-related fatalities are suicides. Robin believes this number is too high and is actively working to help stop suicide. Robin’s desire to educate staff and customers alike on the warning signs of suicide sparked when a suicide occurred at her range. 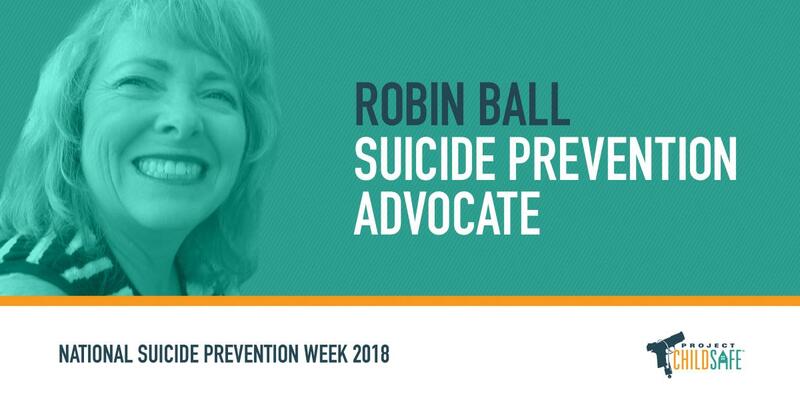 Robin became involved with local committees and initiatives for suicide prevention and has made the issue a regular topic of conversation with her employees. She also has made it mandatory for new employees to complete training on suicide prevention. Robin and her staff frequently use the Firearms and Suicide Prevention brochure, developed by the National Shooting Sports Foundation (NSSF) in partnership with the American Foundation for Suicide Prevention (AFSP). She also uses ASFP-NSSF Suicide Prevention Toolkit, and has spoken with other retailers about suicide prevention, providing them with materials and information about ASFP and NSSF’s toolkit. In 2017, AFSP and NSSF embarked on a national firearms and suicide prevention program focused on educating the gun-owning community on warning signs, risk factors and methods to keep firearms out of reach from those who might wish to harm themselves. Suicide prevention experts note that because suicide is often an impulsive act, putting time and distance between a person in crisis and lethal methods can help save a life. Having a “brave conversation” with someone, as the AFSP-NSSF poster encourages, and keeping firearms and other potentially harmful means out of reach are deterrents. Robin also has several of these posters displayed around her store, as reminders for her customers and employees. In addition to encouraging her staff to use their judgment and keep their eyes open for unsettling situations, Robin reinforces the importance of safe storage throughout her store with Project ChildSafe posters for both her customers and employees. She says that safe storage is important, but not only for keeping firearms away from kids. “Time can change a situation. Whether it’s parents suddenly dealing with moody teenagers, having your kids bring their friends over or having a spouse who is beginning to suffer from dementia – it’s important to not give them access to your firearms,” says Ball. Project ChildSafe is proud to work with Robin Ball and to recognize her efforts for suicide prevention and safe storage. If you are in crisis, call the National Suicide Prevention Lifeline at 1-800-273-TALK (8255) or contact the Crisis Text Line by texting TALK to 741-741.